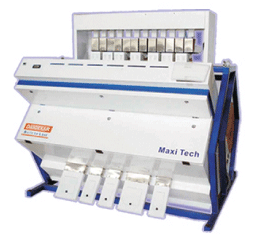 Maxi tech color sorter is a multipurpose sorter which comes with a very high resolution CCD camera capable of detecting minute defects like tips, dots and subtle color variations. It has provided with a 2048 pixel high sensitivity, Linescan double view CCD camera with a very high speed of scanning of 20000 lines/sec. This achieves accurate sorting and detecting subtle color. Touch panel is provided for ease of operation. It can remove chalky rice along with discolored rice. It has provided with self diagnosis and ejector testing. Online double re-sort system for best ratio rejection. High speed processing which can scan 20000 lines/sec for accurate sorting. Touch panel for ease of operation. Self diagnosis and ejector testing. Can remove chalky rice along with discolored rice. Online Double re-sort system for best Ratio Rejection. 2048 pixel high sensitivity Linescan double view CCD camera.